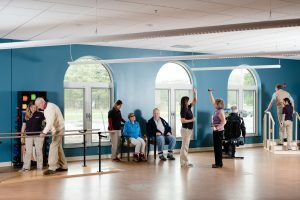 CooperVista Rehabilitation at Westminster Village opened June 2016 and offers 20 new, private rooms, Medicare Certified, specializing Post-Acute Care for recovering after an illness or surgery for a safe return home, bringing the total number of private rooms in the Health Center to 62. CooperVista Rehabilitation will focus on restoring lost abilities by providing physician-led therapy services 7 days a week. CooperVista is named for Dr. Robert Cooper and his wife Esther whose generous gift of the land that Westminster is built upon has made the successes of these 42 years possible. Specific services are also available with our Wound Specialist, Infection Control Specialist and a Certified Lymphedema Specialist. Selective menus meet a variety of nutritional needs and change daily. By assisting the individual in regaining strength, endurance, balance and improved coordination, a quicker recovery can be expected. The new, state-of-the-art Therapy Gym, outdoor Therapy Garden and Occupational Therapy Suite maximize function for an even earlier return home. Whether you are recovering from an illness or injury, our certified skilled therapists from Paragon Therapy are ready to assist you in achieving your personal goals. Discover how we can help you reach your maximum potential. OCCUPATIONAL THERAPY: is able to assist with many areas of Activities of Daily Living (ADL’s), such as increased difficulty or effort performing dressing, bathing, cooking/eating, and/or taking care of the home. OT is also able to address weakness and pain resulting from upper extremity surgery or injury. PHYSICAL THERAPY: is able to assist with difficulty walking, balance/instability problems and/or fear of falling. PT can also address issues of poor tolerance to activities, pain or weakness from surgery or injury to the lower extremities or spine. SPEECH THERAPY: is able to assist with problems in swallowing foods and/or liquids or coughing with meals. ST is also able to address decreased ability to speak, changes in voicing and difficulty with memory and cognition. OUTPATIENT THERAPY: is able to assist you resume a productive and satisfying life. Physical and Occupational Therapists work with all manner of conditions to assist patients with decreasing pain and improving strength, endurance, balance, and range of motion.